Are our laws prepackaged or homegrown? Does it matter? The State House is seen in Augusta. AUGUSTA, Maine — During the 2010 election, Republicans made gains in more state legislatures across the country than in any other election in nearly a century. Maine was particularly friendly to the GOP as voters handed Republicans the House, Senate and the governor’s office. With that power, Maine’s new political majority — with some help from the American Legislative Exchange Council, a Washington, D.C.-based conservative lobbying group — set the agenda on a whole host of issues, many of which gained little if any traction during three-plus decades of Democratic control. In the last several weeks, liberal groups have tried — often successfully — to link the organization to Republican-backed legislation in several states, including Maine. ALEC has been in the national spotlight recently since the launch of a website, alecexposed.org, revealed previously private documents associated with the group. Critics believe the organization and its influential corporate financial backers have been pushing a conservative national playbook of legislation in as many states as possible. The group does this through “model legislation” that is crafted and offered to ALEC members at no cost. State Sen. Richard Rosen of Bucksport, the Maine chairman for ALEC, said the group is not as sinister as its detractors would have the public believe. Instead, Rosen said ALEC is similar to many other national organizations that provide resources and networking opportunities for legislators across state lines. Maine Democrats, however, believe ALEC has a much broader influence that reaches the office of Gov. Paul LePage. Grant specifically referenced Republican legislation in Maine designed to privatize health insurance, scale back voting rights and weaken unions as concrete examples of ALEC’s influence in Maine. “These aren’t Maine ideas for Maine problems. They are ALEC’s ideas, unrelated to our problems,” Grant said. Rosen chuckled when asked whether his caucus took cues from ALEC during the recent legislative session. Larry Sabato, director of the Center for Politics at the University of Virginia, said he’s not surprised that ALEC has received more attention lately. From a state legislature standpoint, 2010 was the Republicans’ best election year since the 1920s. State legislatures in Wisconsin and Ohio have endured criticism for being heavily influenced by ALEC, particularly on union-related bills, but other states have seen similar debates play out, too. Since the 2010 elections, Maine seems to be one of those states. Republicans took back the Maine House of Representatives for the first time since 1974 and then seized the Senate, which had been under Democratic control for all but one two-year period since 1982. The trifecta was completed with the election of LePage. By the time LePage was inaugurated in January, Republicans were eager to begin — in their words — reversing the direction Maine had been headed under Democratic leadership. The new majority was ambitious and productive during its first Legislative session, which adjourned in late June. Among the victories cited by Republicans were overhauling health insurance, streamlining the regulatory process and starting to address welfare reform. Although they don’t count as victories yet, Republicans also pushed the debate on right-to-work legislation aimed at weakening unions and on voter identification requirements, two issues that will be carried over to the next session. A review of several of the laws championed by the GOP majority suggest that Maine lawmakers were at least influenced by ALEC, but there are a few instances where state lawmakers appeared to use the group’s model legislation. In addition to LD 1333, the health insurance bill, and LD 788, the right-to-work bill, other recently debated legislation that had close ties to ALEC model legislation include LD 659, which sought to repeal clean election laws, and LD 1457, which required parental consent for abortions. Where LePage fits into the ALEC discussion is not clear. The governor has never been a legislator and his spokeswoman, Adrienne Bennett, said he has no ties to the group. Maine Democrats, however, believe the governor is being influenced by the national conservative organization and said his connection to Ann Robinson is proof. Robinson, a lobbyist with the law firm Preti Flaherty who recently was named ALEC’s co-chairwoman for Maine, served on LePage’s transition team and also helped craft LD 1, the governor’s regulatory reform bill. Despite Democrats’ claims, Bennett said Robinson is not a regular adviser to LePage. Republicans don’t own the market on receiving help from ideological policy groups. The national Progressive States Network has provided model legislation and networking mostly to Democrats for many years. Other, less partisan groups include the National Conference of State Legislatures and the Council of State Governments. The difference, Democrats say, is that those organizations are funded largely by nonprofit foundations not corporate giants, such as oil and tobacco companies. In the case of NCSL, entire state legislatures — Democrats and Republicans included — pay dues for their states, so they are truly nonpartisan. Sabato agreed that there is nothing on the political left that is as well-funded and influential as ALEC. Rep. Michael Carey, D-Lewiston, said the issue is not necessarily that Republicans are taking cues from this group, it’s that they haven’t been honest with constituents. Like many think tanks or lobbying groups, ALEC claims to be nonpartisan, but a majority of members are Republicans. Its website indicates that ALEC stands for limited government, free market philosophies and federalist principles, an ideological framework supported by the GOP. Rosen said he has been a member of ALEC for several years. Many other Maine lawmakers are members, too, but he didn’t have an exact number. ALEC’s membership rolls are private, so that number remains a mystery, but the cost to join is only $50 a year. No Democrats are on the list, but Rosen said there are Democratic members of ALEC in Southern and Western states. “It really is nonpartisan,” he said. Rep. Andre Cushing, R-Hampden, the assistant house majority leader, recently attended an ALEC conference in New Orleans at the encouragement of House Speaker Robert Nutting, R-Oakland. Cushing said it was a great resource for him but downplayed the notion that ALEC has pushed model legislation on states. “There are pros and cons to using model legislation,” he said. “The pro is that you start with a basis that is reviewed by legal and policy experts, but the con is that it’s ready-made legislation that may not work for every state. Rosen said that even if ALEC’s ideas have made their way to Maine, so what? Democrats outsource their ideas, too, he said. “Nearly every single piece of legislation that the [Democratic] majority brought forward was in part developed and driven by interests outside the state of Maine,” Rosen said. Asked to provide an example, the Bucksport senator said the ban of bisphenol-A in certain plastic items — which LePage opposed — was pushed by national environmental groups. 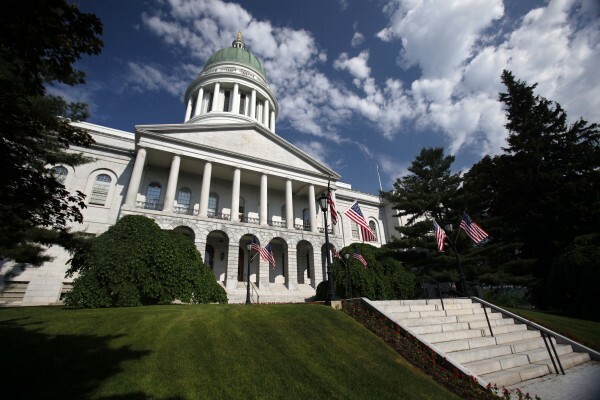 “I don’t want to diminish the Maine sponsors of that legislation or their passion, but sometimes lawmakers don’t have the capacity and ability to develop complicated, detailed language,” Rosen said. The biggest criticism of ALEC remains the powerful funding arms behind it. Major donors include the Koch Brothers, the American Petroleum Institute, ExxonMobil, and big drug and tobacco companies. Democrats say that corporate influence belies the notion that Republicans are the party of regular people.